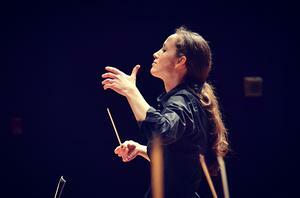 Jessica Cottis discusses "Why has classical music been so gender-biased for so long?" Hurrah for Radio 3 and its (long-overdue) efforts to give us music not just performed by women but composed, and conducted, by them too. Last year’s innovative day of programming for International Women’s Day introduced us to composers many of us had never heard of, such as Elisabeth Jacquet de la Guerre and Barbara Strozzi, Charlotte Bray and Anna Clyne. Yet to the surprise of even the most sceptical critics, the day was a huge success, proving that some of this music is really good. As Edwina Wolstencroft, producer last year and responsible for this year’s celebration of women in music, says, ‘We know that as many as 6,000 women composers have been identified in history.’ Why, then, do most of us know of only a handful — such as Hildegard, Smyth and Holst (I)? She conducted the live concert on Tuesday night of music by composers including the familiar, Thea Musgrave, Sally Beamish and Roxanna Panufnik, with names much less well known, Libby Larsen and Joanna Marsh. Growing up in the 1990s, Cottis never thought of herself as a conductor because she had never seen a woman on the podium (apart from when she played in the school band). ‘I didn’t realise women could conduct.’ You only have to look at the photos used to promote the recordings of conductors like Herbert von Karajan to realise that conducting is ‘an archetypal male discipline …focusing on strength, power and virility’. Cottis only became a conductor after she was forced to abandon her career as an organist after developing carpal tunnel syndrome, losing all feeling in her hands when she was in her mid-twenties. In desperation she took a conducting course at the Royal Academy of Music as the only thing she could still do in music. Once on the podium, though, she found her ‘musical voice’. Her mission now is to be a role model to young girls and to show them it is possible for them also to take up conducting (she was the only woman on her course back in 2006). It’s strange that the western classical tradition has been so gender-biased for so long if you consider how we listen to music. Not as men, or women, but as ourselves. And as Cottis insists, ‘I don’t think of gender when I’m performing.’ I’m not a fan of positive discrimination or of fencing off books, paintings, music into women-only zones, but there’s no denying the impact of last year’s Radio 3 day. This week’s Composer of the Week (presented by Donald Macleod, the only male voice allowed on the station on Tuesday) featured the music of Barbara Strozzi, the 17th-century Venetian-born composer who so impressed last year. Women composers have at last been added to the A-level music syllabus (after an internet campaign by 17-year-old Jessy McCabe) when before there were none (extraordinary to think it has taken so long). Classic FM, too, has embarked on its own campaign with a recorded concert of music by women on Tuesday night, including Clara Schumann and Fanny Mendelssohn but also the Nonet in E flat by the prolific French composer Louise Farrenc, who created symphonies, piano sonatas, songs, choral works. Maybe by 2026 we won’t need a women-only day; their music will have become so much part of the fabric of a Radio 3 day that their place in the schedule will be taken for granted, no longer an exception, a privilege, a surprise, but as integral to the station as Schumann (R) and Mendelssohn (Fe).